The designer look without the designer price tag, Redsbaby has you covered with a pram that’s as stylish as it is practical, with a price tag that has to be seen to be believed. Redsbaby founders Meagan and Brett Redelman know what Australian parents want – a pram that provides the safest of rides for their precious bundles but is also easy on the eye. A blend of style and function, Meagan and Brett launched their brand with their beautiful debut pram, the Redsbaby Bounce and there’s no doubt about it, it has everything new parents are looking for. The Redsbaby Bounce is the ultimate all-in-one pram. Suitable for newborn babies, with the bassinet attachment for babies weighing up to nine kilograms, switch to the reversible seat for older babies and toddlers with a weight limit of seventeen kilograms. The seat reclines in four positions and is paired with the magnificently large retractable sun canopy (complete with magnetic peekaboo window for ease of checking on sleeping – or near sleeping – baby). We all want the safest ride possible and your child’s safety is paramount for the Redsbaby team. You can be rest assured they’ve got your little one covered – they’re proud to report that the Redsbaby Bounce is one of the only prams to comply with the very latest Australians Safety Standards (AS/NZS 2088:2013), with independent testing to be sure of it. Perfect for all terrain use, the Redsbaby Bounce has a lightweight frame that weighs just over eight kilograms, complete with its puncture proof tyres. The four wheel design is provides optimum weight distribution and four wheel suspension contributes to a super smooth ride. When you’re done and it comes time to fold the pram, it couldn’t be simpler thanks to the single pull action fold. Too easy! You have to like the look of your pram and we adore the look of the Redsbaby Bounce. 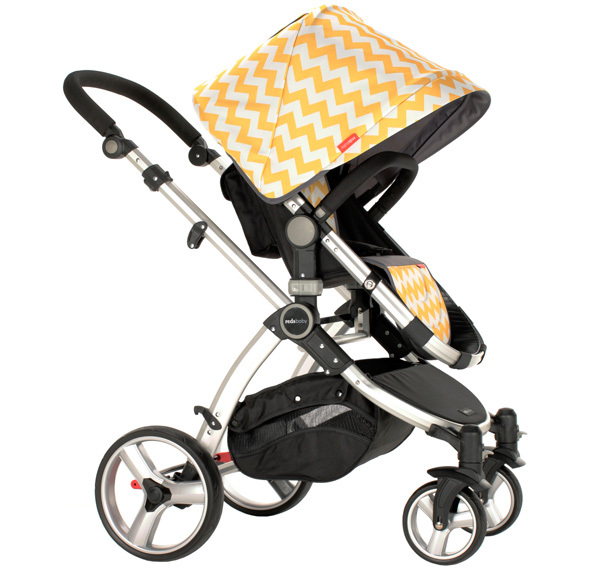 Available in modern prints and contemporary solid colours, this is one pram that is sure to turn heads on the street. The seat has awesome removable fabrics for cleaning without any fuss and storage space in spades – from the massive easy access under basket to the seat back organiser, perfect for keeping yours and bub’s essentials for easy, quick access. How much for such a pram with superb street cred, I hear you ask. Redsbaby Bounce is priced $499 for the pram alone or $549 for the pram and coordinating bassinet. I told you, designer look without the designer price tag. Use the money you save to treat yourselves a coffee and lunch at the local cafe to show it off – every week for baby’s first year! Redsbaby Bounce is available directly from Redsbaby. Take advantage of the early-bird $10 shipping by pre-ordering yours now for an April delivery.